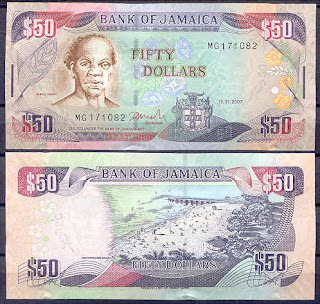 The Bank of Jamaica is to introduce a commemorative $50 bank-note into circulation to mark its 50th year in existence. While the actual anniversary celebrations are expected to begin in May 2011, the note will go into circulation next Monday. The Bank of Jamaica Act was passed in October 1960, with the bank opening its door nine months later in May 1961. "What is significant is that the Bank of Jamaica has come to be accepted as one of the most important components of the entire financial and, of course, monetary structure of the country," said Brian Wynter, governor of the central bank. As with the present $50 note now in circulation, all the design and security features remain the same. An exception, however, is that the bank's logo printed in blue, with the words '50th anniversary and 1960-2010', above and below the logo, now appears on the face of the commemorative note. On the reverse side of the commemorative note is featured a vignette depicting the Bank of Jamaica building at Nethersole Place set against a medallion background of morning glory blossoms, replacing the Doctors Cave Beach vignette on the reverse of the $50 banknote currently in circulation. A plaque of the commemorative note was presented to one of the first employees of the bank, Dorothy Clark, at its quarterly press briefing on Wednesday morning. The new note is a limited-edition one, to be circulated alongside the regular $50 note, both being legal tender. Van zo'n swingend land had ik toch echt wel wat mooiere en vrolijkere biljetten verwacht. Wel heel erg leuk dat je dit nieuws even met ons deelt Surbe! Ik heb vandaag het oude type gekregen van een collega . Ik zal morgen ff posten in nieuwe aanwinsten. Mooie biljetten. Volgens mij is hier geen sprake van een variant maar van een nieuw type. De keerzijde is vrijwel volledig gewijzigd. Wel leuk om te zien! je hebt helemaal gelijk . Misschien past 'ie beter bij "wereldbiljetten". Kan een moderater 'm daar naar verplaatsen? Ondanks de meneer op de voorkant niet moeders mooiste is, gaat deze wel in mijn collectie komen, aangezien Jamaica een van mijn aandachtsgebieden is. Overigens Ik heb 'm nog niet gevonden op ebay, maar dat zal binnenkort wel komen.